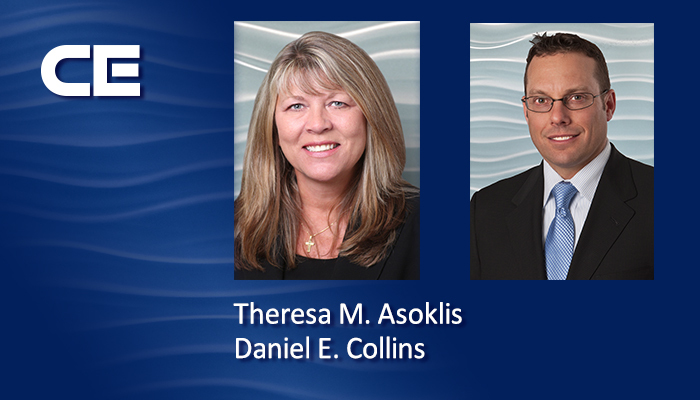 Effective May 1, 2019, Dan Collins and Theresa Asoklis will take over as the firm’s co-managing shareholders. After 10 years at the helm of Collins Einhorn Farrell PC, Neil MacCallum and Mike Sullivan are passing the torch. 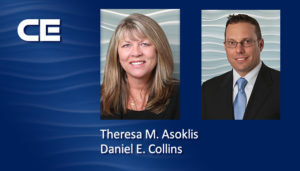 Effective May 1, 2019, Dan Collins and Theresa Asoklis will take over as the firm’s co-managing shareholders. The firm traces its origins to 1971, when the late Mort Collins asked Brian Einhorn and then Clay Farrell to join forces. Over the next 48 years, the firm grew to over 60 attorneys. With support staff, Collins Einhorn now includes a client-focused team of 120 employees. Asoklis is one of the leaders of the firm’s Professional Liability practice group. And Collins—the son of firm founder Mort Collins—is one of the leaders of the firm’s nationally known Asbestos and Toxic Tort practice. Asoklis and Collins will be the third generation of firm leadership, and will look to build on the firm’s long track record of success and stellar client service. Sullivan will remain a key member of the firm’s Professional Liability team, and will focus the next phase of his career on client service and quality control. MacCallum will continue his prominent role in the firm’s Asbestos and Toxic Tort practice group, focusing on client relationships and client service. Both Sullivan and MacCallum will work to ensure that the next generation of CEF lawyers is steeped in the culture that has made the firm a home for talented lawyers and staff, many of whom have spent their entire careers at CEF. Collins Einhorn Farrell PC is a multi-specialty defense litigation firm, serving clients in the areas of Appellate Practice, Asbestos/Toxic Tort, Employment Practices Liability, Fire and Explosion Litigation, General and Automotive Liability, Attorney/Judicial Ethics and Grievance Defense, Insurance Coverage, Medical Malpractice, Product Liability, and Professional Liability. For more information, visit www.ceflawyers.com or call 248-355-4141.